Before presenting the details of the hardware design, I will present some notes and updates that have come to my attention while testing the motor controller. There are also some people worldwide who have rebuilt my motor controller and got it working after I helped them a bit, so I have also added the issues they have encountered here. * UPDATE * I replaced the 3.3V regulator with the TC2117-3.3VDBTR and got rid of a few problems. The dropout voltage on the other regulator was probably too close to the difference between 5V and 3.3V, so sometimes the 3.3V supply would drop. * IMPORTANT UPDATE * Replace L2, L3 and L4 with 0 ohm resistors. Otherwise, the DRV8302 will keep dying randomly. NOTE: This is fixed in the latest hardware versions on github. I strongly suggest that you use one of them. * UPDATE * If the motor controller resets when drawing large current spikes, the cause can be that the buck converter shuts down for a while. I noticed this on my RC car when I set the current limit to 150A. I solved that by removing C26 from the SS_TR pin on the DRV8302. 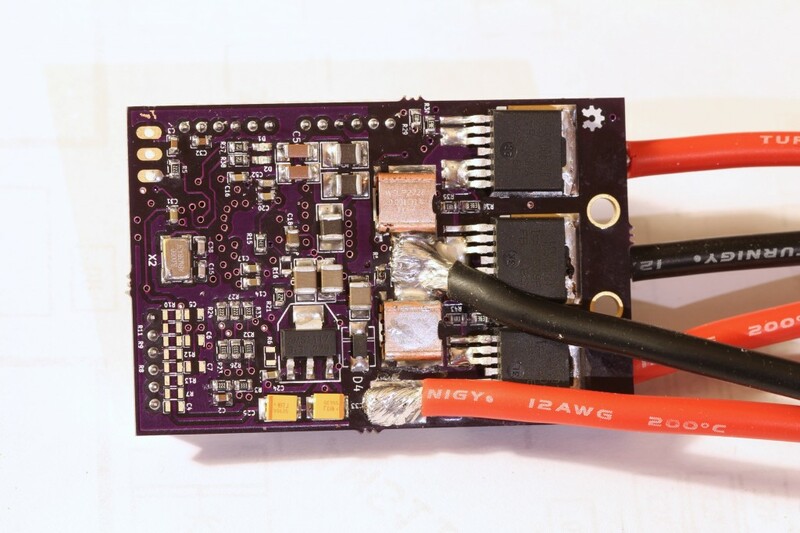 This will disable the slow start feature of the buck converter, which makes it start up fast enough after shutting down for the microcontroller not to shut down. I don’t know if this is a proper solution, but it has been working for the few hours I tested the RC car without problems. * NOTE * The pad under the DRV8302 has to be soldered. If it isn’t, the motor controller will not work for sure. The pad is not just for thermal cooling, it is also the only ground of the DRV8302. IMPORTANT UPDATE: A new version of the hardware can be found here: https://github.com/vedderb/bldc-hardware I will write a new post about that and the large amount of recent updates soon. If you want to build this motor controller, please use the hardware from this github link since it has many important fixes and features. There is also a new BOM linked from github. The KiCad-files can be downloaded here. If you are missing any KiCad libraries for this project, they can hopefully be found here. Note that the hall sensor position in the screenshot above is constant because there are no hall sensors connected. When adding custom hall sensors to BLDC motors, their position can be adjusted by comparing their output to the estimated rotor position in sensorless mode. 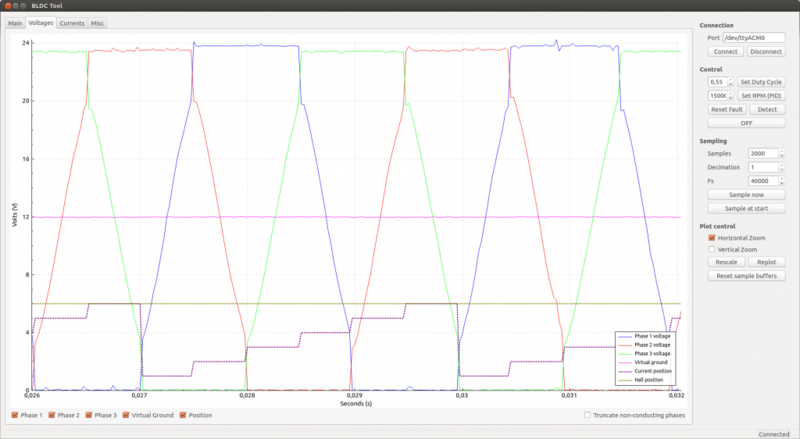 Plotting the hall sensor position while running the motor in sensorless mode is therefore very useful. 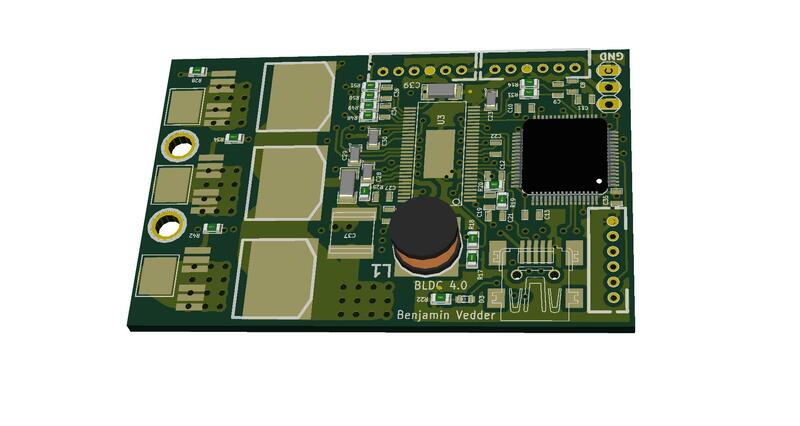 The STM32 code for the BLDC controller can be downloaded here. In order to build and run it, ChibiOS with the ST libraries and a minor modification is required – you can download it here. To set up the required toolchain you can have a look at this post. 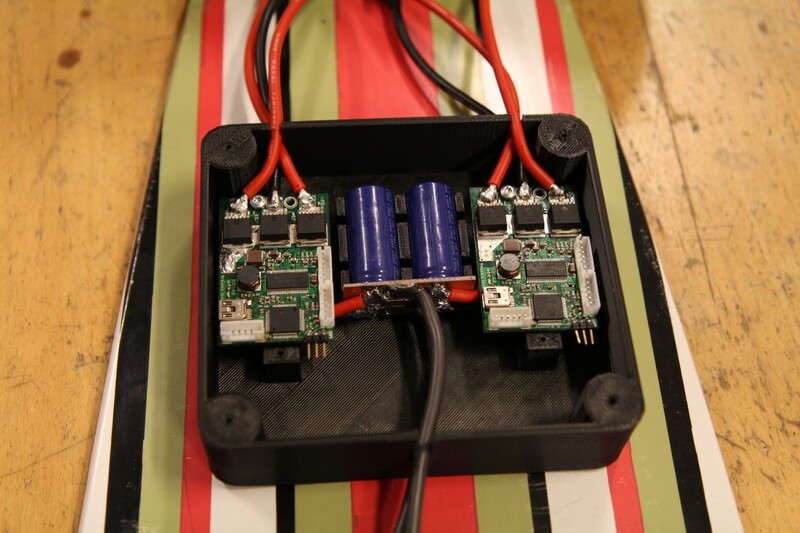 Now you should be able to start the program and connect to the motor controller. In this section I will describe how to run an outrunner motor in sensorless mode from Ubuntu Linux. The reason for using an outrunner is that the parameters in the github project are tuned to work with most of my outrunners that I have at home. 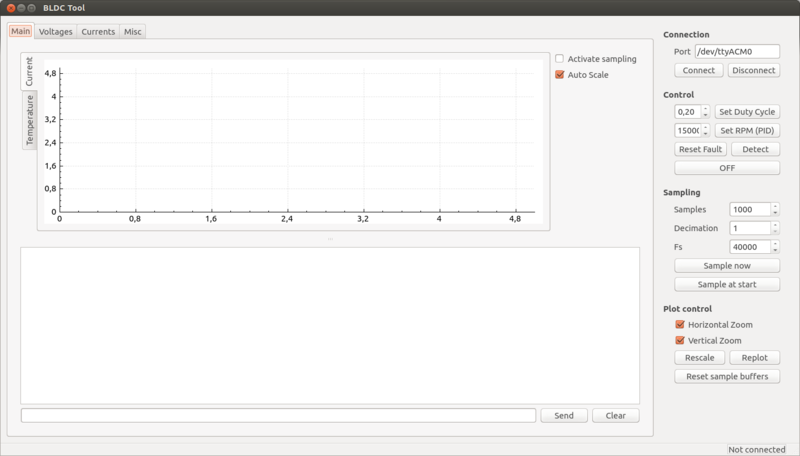 Adjusting MCPWM_CYCLE_INT_LIMIT in the mcconf file can affects the timing and should be tuned for each individual motor. Note: The start-up torque in sensorless mode is higher than on most sensorless hobby ESCs, but the algorithm to start the motor will cause a delay before closed-loop commutation can be used. This delay is not desirable when e.g. building a sumo robot such as this one, so in such applications a sensored motor and the sensored mode is recommended. Add your user to the dialout group as described here. Log out and log back in. This is done in order to access the serial port emulated by the USB interface of the motor controller. If you don’t any 3g modem on your computer, remove the modemmanager package. This is because otherwise there will be many seconds delay before the Qt program can access the USB port since modemmanager is interfering (I’m sure that this can be solved in some other way). Install a toolchain for compiling and uploading the STM32F4 code. See this post for a tutorial. Download the ChibiOS-version with a minor USB modification: ChibiOS-RT-master. This modification disables the voltage sensing on the VBUS pin because that pin is used for something else. 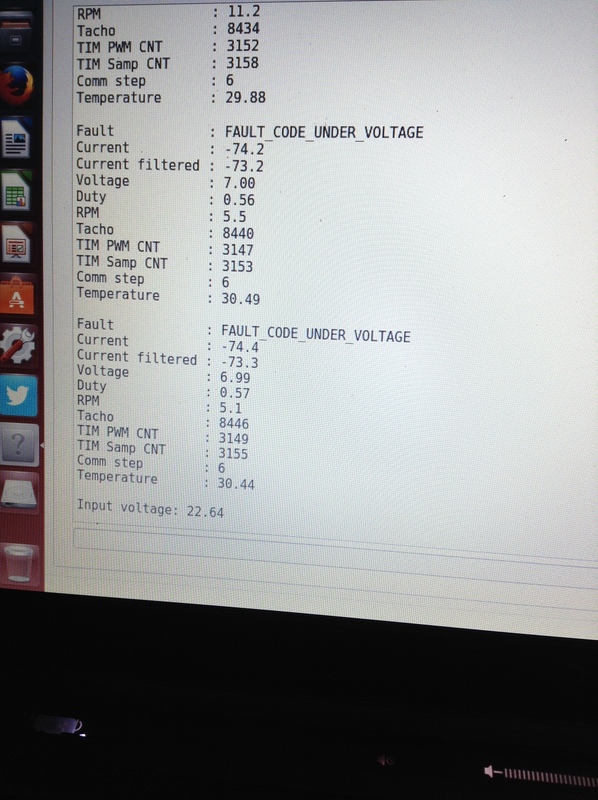 Compile and upload the program to the motor controller. How to use a discovery board as a programmer can be seen here. Assemble the PCB. The component position sheets above are very useful for that. Connect the outrunner motor and a power supply to the BLDC controller. Download the STM32 code here. Set the path in the makefile to where you have extracted ChibiOS. Compile and upload the program. [ 8198.395006] cdc_acm 1-5.3:1.0: This device cannot do calls on its own. It is not a modem. 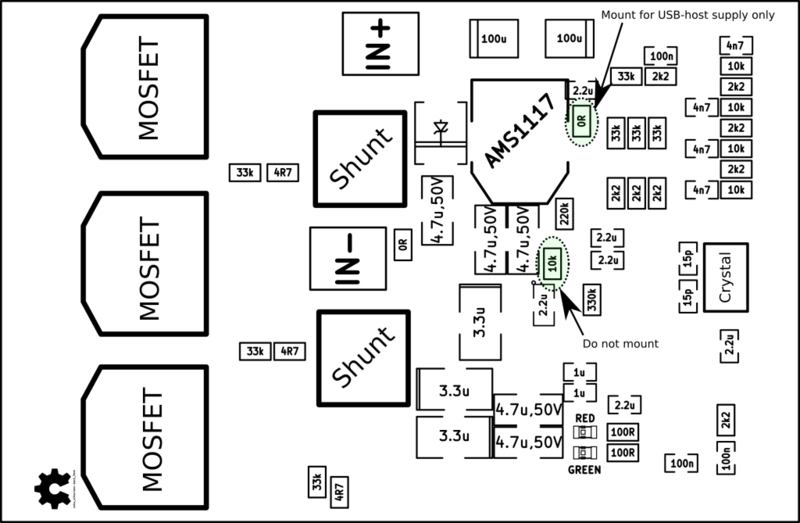 Connect to the BLDC controller with the connect button. The lower right corner of the GUI should say Connected. Use the right and left arrow keys or the buttons in the GUI to run the motor. Activate the real-time sampling (with the checkbox in the main tab) to see the currents etc. in real time. Study the code and use/adapt the interfaces for your own application. This entry was posted in Electronics/Hardware, Embedded Software, Projects, Software and tagged ARM, ARM BLDC, ARM ESC, BLDC, ChibiOS, custom ESC, DRV8301, DRV8302, ESC, linux, PCB, robot-sm, RobotSM, STM32 BLDC, STM32 ESC, STM32F4, Ubuntu, usb, USB-CDC by Benjamin. Bookmark the permalink. I would like to order PCBs, are these gerber files tested on a PCB? Looking forward to build an ebike and longboard with your controller. 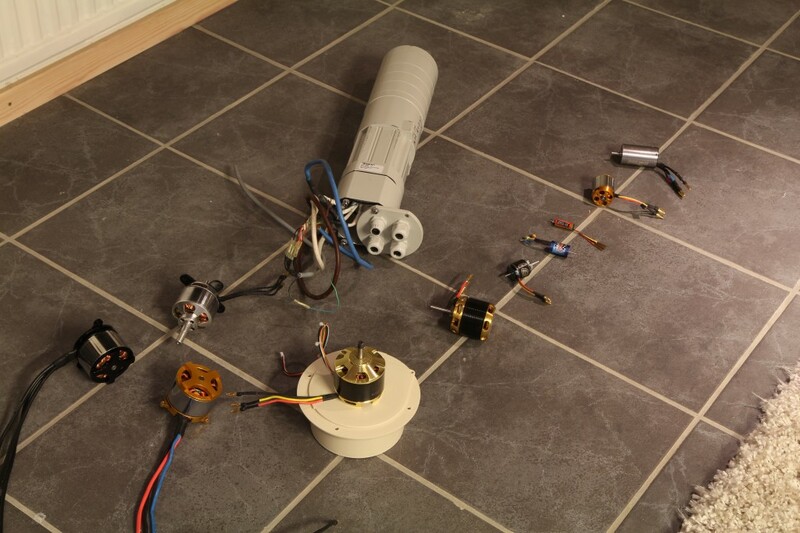 I am working on a similar project, but for 400V industrial AC servos with resolvers with IGBTs. It will eventually be controlled by linuxcnc. Hi Benjamin, I looked at different ESCs, Hobbywing Xerun, ESC32 and for the latter I even started to make some code modifications in the STM32 firmware. 1.1. The motor startup should not spin the motor to a minimum rpm, it should use forced commutation initially and then switch to proper commutation. I have seen that in sensorless mode you do have a min rpm. 1.2. Requires active breaking, imagine the car would roll downhill by itself with 100rpms, the target rpm is 20 or even zero. So it needs to break actively using regenerative breaking as long as possible and a zero speed apply an initial break force. 2. As silent as possible. This is the area I am uncertain but a sinusoidal PWM I would have high hopes for. Anybody interested in joining forces? Anybody interested in a cablecam camera rig? Oh, if somebody has a spare board ready to run (I cannot solder SMD) for sell, please contact me. 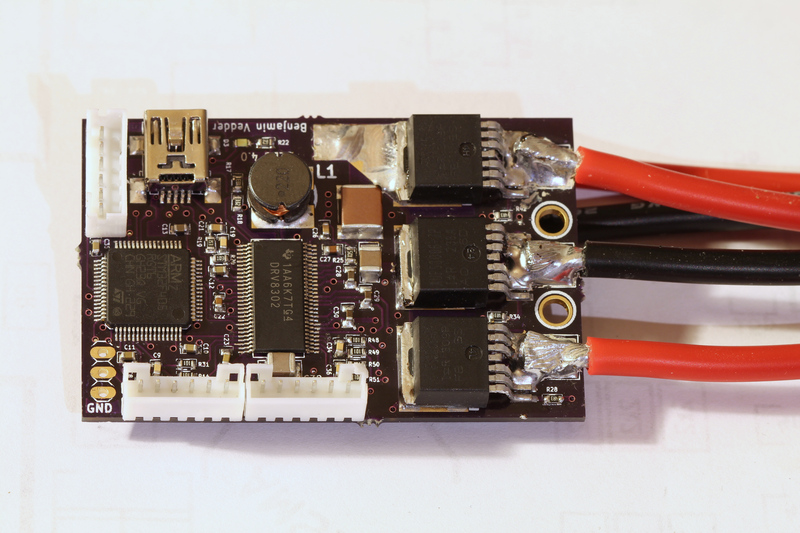 Do you consider making a position servo controller with the FOC library ? Congratulation ! You made a great piece of software and hardware. I have a Nucleo STM32F401 and I’d like to make a shield for it based on your board to control an outrunner in a closed loop motion project. It seems that we can get all the STM32F4 pins on the morphos connectors. It will be usefull to use the STlink USB connection to run your nice Qt supervisor. In which file is the port config for using PA2 and PA3 in place of PA11 and PA12 for USB ? I have to redirect also SENS1 from PA2 to another free port. This is a very interesting project. I have an ebike application and was looking for suitable FOC controller for some time now, I even attempted my own project with AT90WPM3B (8bit AVR with advanced power stage controller). Found some purchasable controllers, but all of them are either too big or have too many problems, or both. Some explode on heavy startup, others have too low PWM frequency and can’t work with low inductance outrunners, etc… So I really hope you will succeed with this. A short question about your MCU choice (STM32F4xx). To my knowledge, it has no analog comparators, meaning that cycle-by-cycle current limiting is harder to achieve and is being done in software. That usually adds some delays and could end up as a problem, especially with low resistance and inductance motors (for example 10mΩ 15μH). AFAIK, only STM32F303xB/C has this functionality in hardware. Have you considered this part? i am a guy from china.i have read you code a few days ,but it’s a little diffuct for me to understand.so i wander do you have any tutorial about how you word.can you share me the tutorial that you have ,or the wedsite.thanks a lot. my e-mail address is shifm_od@163.com.thanks again. red – off, geen on (low)). Was it a hardware error? I happen to have the same error with the 2 esc’s I just soldered. I didn’t notice this comment before. Which HW version are you using? 4.0 does not have 22 ohm series resistors on the d+ and d- lines, and maybe that doesn’t work on some computers, although I haven’t experienced that problem on any computer myself. You could try a different USB port or with/without an USB hub. Also, make sure that R6 is not mounted. It seems there are different issues I have to resolve first. The red led blinks 4 times which corresponds to the FAULT_CODE_ABS_OVER_CURRENT according to the code in datatypes.h – but I’m only suppling the esc with 8.5v@100mA. And on the 2nd esc the DRV8302 seems to be soldered incorrectly since it won’t light the blue led when connecting power. Sorry, forgot to mention that it is hw version 4.0. Can you, please, explain a little bit more what exactly do you integrate and how the result is used in the commutation algorithm? It is not as simple as that though for most motors. Depending on how the PWM is done, there is some position-dependent voltage on the back-emf signal of the motor that makes a lot of difference at low speeds. Compensating for this is how I got good low-speed performance. Our school has a project regarding BLDC motor control. We are using the sensorless and the sensored bldc motor. Upon reading tutorials and forums regarding BLDC motors, I feel that I am still a novice in this topic. We will fabricate our own version of controller later this week. Is there a way that I can have a consultation with you? i assembled the board, programmed it and its running fine! Great job Benjamin! I am wondering if i am doing something wrong with the motor detection function. It is not working as described. When i press the Motor detect button, nothing happens for about 1sec, then a very short “tic” is noticeable and then i get a failure report in the output window. Is there something i missed? i am running in PPM control mode with dutycycle control. I the fle “conf_general.c” i fount the function “conf_general_detect_motor_param”. Is this the one which does the Motor test? Shall the PPM signal be zero when the function is invoked? Does this mean in case the dutycycle is lower than 0.6, the function does not work? Do i have to start the motor manually? Nice that you got it assembled! To run detection, you have to disable ppm input because it will stop the motor as soon as detection tries to start it. 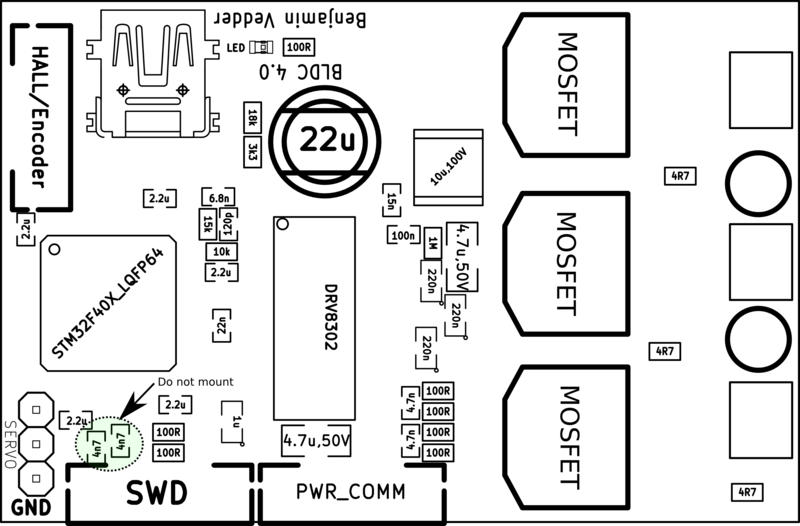 Detection runs the motor at the specified current until the duty cycle reaches 0.6, then releases it and measures the back emf. After that, it will run the motor at low duty cycle and measure the Coupling. This is not always working, so I will implement some other detection methods soon. I’m interested in what is the max MCU usage in %? At the highest switching frequency a rough estimate is around 50% based on the cycle measurement timer. The code can be optimized a lot, but I won’t spend time on that until performance becomes an issue. I asked about the MCU usage because I wonder is there a suitable MCU to drive 4 x BLDCs simultaneously? Impressive work! I am currently doing a quadcopter project and I am going to build a motor controller instead of using ESCs. My motor is rated at 15A, 1100kv. I am planning to use DRV8301 with CSD18502KCS N-channel power MOSFET, and dsPic33E microcontroller. That would give me the max current at 14A. What do you think about this? Also if I were going to use some of your technique, can I design 4 motor controllers in a single board? 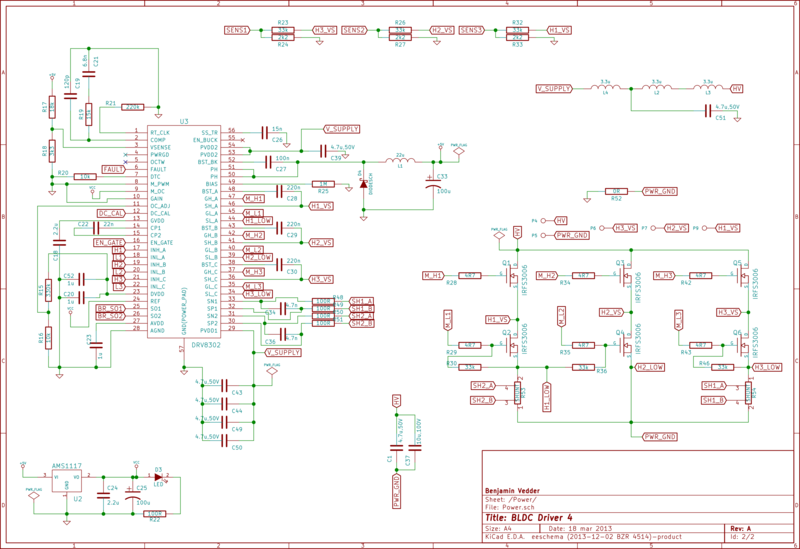 That means I have 1 microcontroller, 4 DRV8301/02, and 24 MOSFETs on a single board. Do you think it is possible or do you have any suggestion? And your continuous current is 50A, it would be too much to drive a 15A motor, what would you do to design a lower output current motor controller? 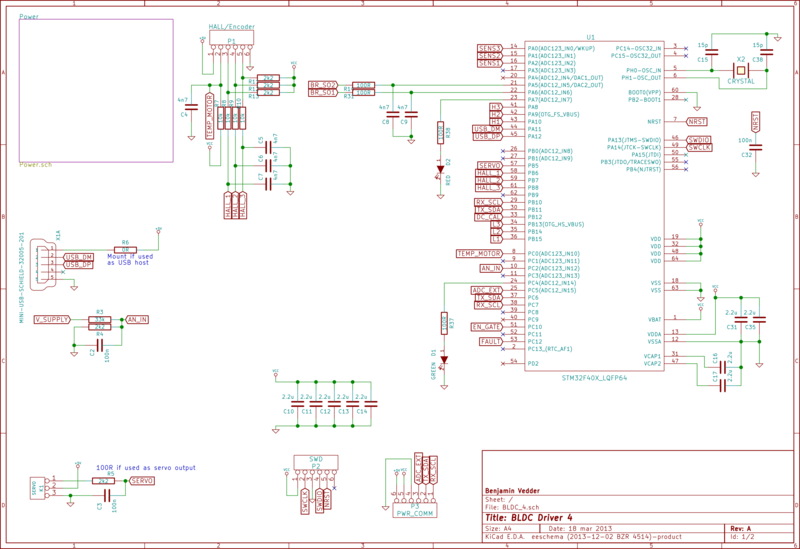 One more thing is that I am trying to draw the schematic using Eagle CAD, but I couldn’t find components such as DRV8301/02 and mosfets. Do you have any ideas to find these components library? I know you are using KiCad, and I’m considering using this too, but do you think I can find all the components in KiCAD? And what a great project! I’d like to know if you have knowledges of references (books, websites, articles) from where it is possible to a lot of the motor (bldc) specific information and strategies. Especially information about designing driver circuits, and running the bldc most efficiently. I’v read a lot of different articles from IEEE and another database (i dont quite remember the name). It seems like i only get “half” of the facts from these articles. I did make a BLDC controller which worked, not very efficiently anyway. But i’m about to design one for a larger project, for which i’d like some “professional” insight. Great projects. I have trying to contact you for some help recently on “Leave a Reply” but not get through. could you please advice how all the other correspondence got through? I suppose pwm isn’t needed if you aren’t varying the speed/torque, but if you are, do you have any thoughts on the most common PWM techniques (bipolar vs unipolar, complimentary vs independent)? State space vector modulation (SVM)? For example, I’ve read that for sensorless bldc, one should pwm both phases (bipolar), otherwise unipolar is better for emi. In addition, if you need 4 quadrant (braking/regeneration) then both switches of a phase should both be pulsed (complimentary and with dead time of course). But what if you don’t need breaking (or your dc supply can’t handle an average current fed back into it), is it better to use independent? Also, someone on irc said the PWM switching frequency should be anywhere from 200hz (high inductance motor) to 64khz (low inductance motor) in order to minimize torque/current ripple at perhaps the expense of audible noise, and that the pwm freq should be at least 10x the commutating frequency, has this been your experience as well? Is there a max rule-of-thumb? Also for a sensorless application, do you prefer sensing zero crossing, then using a timer to trigger the next commutation step, or do you prefer to integrate the back-emf voltage (flux) until you cross a threshold in order to integrate (i.e. the t.i. video you linked above)? Wow, sorry for the long wall of text, but the more I think about motor esc, the more questions jump in my head! I have implement three different PWM techniques and I prefer the synchronous one (having one switch on and pulsing between the upper and lower switch on the other phase). If you don’t want to use braking you can use current control and limit the current. 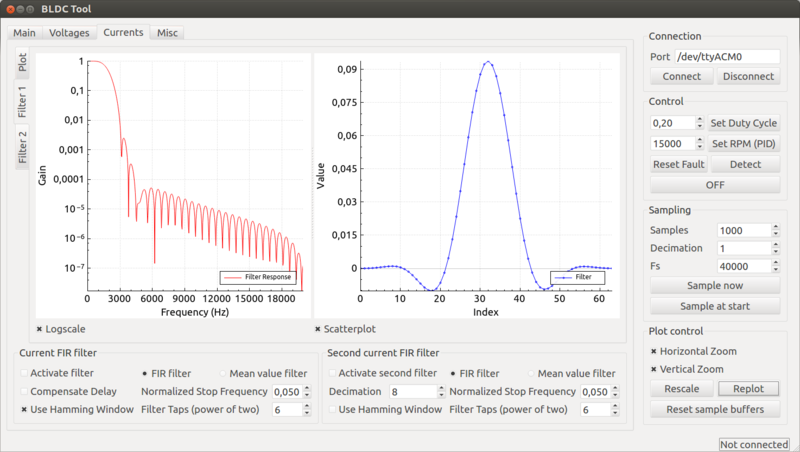 I’m using variable switching frequency to get good samples at low duty cycles. For commutation, I have implemented both zero crossing with delay and integration (both with adjustable timing) and I prefer integrating the voltage because that works better at lower speeds. Integrating the voltage is a bit tricky at low speeds for some motors since some of the input voltage can be seen on the floating phase. Heres a link to the pic of what I have been getting after starting detection. Thank you very much for your great development work and sharing. 2. Can I get the current rate per minute feedback from your ESC controller ? the better way for me is proportional analog output or bus. 1. I haven’t measured the accuracy and it depends on the application, but it should be possible. 2. You can read it over CAN, USB or UART, but there is no analog output. What do you mean by bus? thank for your fast reply and you are quite right! Hi, Is there any way to run Bldc motor without ESC ? I want to run my Turnigy XK1222 at maximum speed all times. I don’t want to use receiver and transmission. No there is no way to run a BLDC motor without ESC because you need a 3-phase rotating system to spin the motor. Will this controller suitable for my 48V 2000W BLDC hub motor (for ebike)..? Yes, a motor like that should work fine with this controller. first of all : impressive ! good job! For my electric mountainboard I would like to use your development. Big question: Do you know someone that can deliver the complete VESC? including all the components already assembled on the PCB? How much would be the price? I checked your schematic and I think I found the reason why the R16 resistor causes the faults.DRV8302 has two over-current protection modes,that is current limit mode and lath shut down mode.In your shcematic,you connect M_OC to vcc,but if you want to use the current limit mode you need to connect pin M_OC to ground otherwise you set the driver in lath shut down mode,which is reason why the mosfets are turn off frequently.But this is a guess,you may verify this by observing the pin OCTW,which is the pin that reports over current error.You can find detailed information on page 13 in the datasheet. Another thing is that I suggets you to add the thermal via array under the DRV8302 driver as this is required by the datasheet.The dimension info can be found in TI application notes SLMA002 and SLMA004. I have tried connecting M_OC to gnd as well and it still has the same problem. I don’t know what the cause is, but it could be because the DRV8302 isn’t designed to drive these kinds of MOSFETs. If you’ve already tried that,then I don’t know what would be the cause.Have you tried DRV8301?It’s similar to DRV8302 but it has a SPI interface to set the parameter and more current gain option,otherwise they are identical.And the prices are pretty much the same.Also,you could compare your board with BOOSTXL-DRV8301(http://www.ti.com/tool/BOOSTXL-DRV8301) and maybe you can find some clues.TI has released the schematic/layout on that website so actually I’m designing a new driver board based on your board and BOOSTXL board.Thank you for your work! How I’ve to understand “…if the motor is driven faster than the corresponding battery voltage,…” ? Is it just the easy kv calculation kv*rpm must be smaller than the batterie voltage V_batt, or must the duty cycle be taken into account? kv*rpm*duty cycle kv = 60Hz * 60sec/min * / 14 / 5V = 51.5. Batterie voltage is 12V. The maximum speed in generator mode is 3000 rpm, what shoul give about 58V. Will the battrerie be destroied due to the too high voltage or is it possible to reduce the voltage by reducing the duty cycle to e.g. 25% by wiriting a custom application? Maxi, if the motor is driven so fast that the back emf rises above the battery voltage, the battery will charge no matter what you do with the duty cycle. Decreasing the duty cycle has the opposite effect – it will increase the voltage output when acting like a generator, which is why you can use regenerative braking down to very low speed. When you construct a system with a battery and generator, you have to make sure that the generator output (RPM / KV) does not rise above the battery voltage. The are some tricks that you could do with FOC and field weakening, but it will not help much in the general case, and it will waste power. 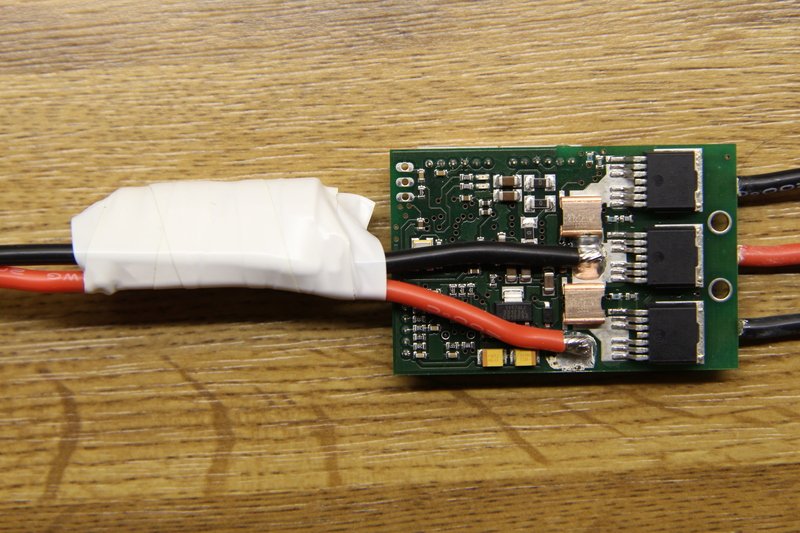 I also recommend using higher battery voltage than 12V to make the VESC and the rest of the system more efficient. thanks for the fast replay! As the VESC provides a huge current I can reduce the number of windings by a factor of about 4.5. Then I’ll end up with ~13V (LiFePo4 batterie) and a kv of ~11,5. Do you thing the VESC can handle such low kv? I can’t get it run, Is that the firmware need to compile under Liniux system? Is that any easy way to download the ESC code like bin and Hex? Have you tried obtaining a sin wave as output to give the motors? Hi vedder, is there a way that i can use this controller like a regular ananlog one for example 0V-2.4 Full forward 2.4-2.6V Full break 2.6-5V Full reverse. Yes, that is what the ADC app is for. The total range is 0V to 3.3V though. I’m building a linear 3 phase BLDC motor and would like to know if I can run this closed loop but at really slow speeds about 0.5mm per second with your controller? Does your code include high frequency injection method? I soldered my board everything is OK and config BLDC Tool works well, but went I connect a small load the drv8302 had died, and I used alot drv8302 but all of it have same problem, I don’t know what reason is?? ?.The difference between my project and your app is 2200uf 50V panasonic capacitor and schottky diode, and I think the problem is schottky diode, do you think so??? schottky diode using to current isolation between FET power and driver power, don’t you? Awesome project! I was wondering if you could give a little bit more information on the algorithm to estimate armature resistance and inductance? I tried reading the code, but inductance estimation is not clear to me.